Laking Toyota adopted a clinic on August 31 and September 1 to help collect blood urgently needed before the long weekend. TORONTO, ONTARIO, December 6, 2017 - Toyota dealers across Canada have partnered with Canadian Blood Services and Héma-Québec to spread awareness and provide opportunities for local communities to donate blood. For 25 years, Toyota has shared its manufacturing knowledge with other manufacturers, government entities and non-profits across North America through the Toyota Production System Support Center (TSSC). Based on the philosophies of the world-renowned Toyota Production System, Toyota has helped hundreds of other organizations enhance productivity, maximize available resources and further improve quality and safety. In Canada, TSSC has collaborated with Canadian Blood Services and Héma-Québec, with a shared goal to continually improve the services they provide for Canadians. As an extension of this partnership, Toyota dealerships across Canada have begun actively engaging with local communities through blood donation clinics, organized group donations and other activities. Toyota Canada employees across the country have also been participating by donating blood at local clinics to further support Canadians in need. 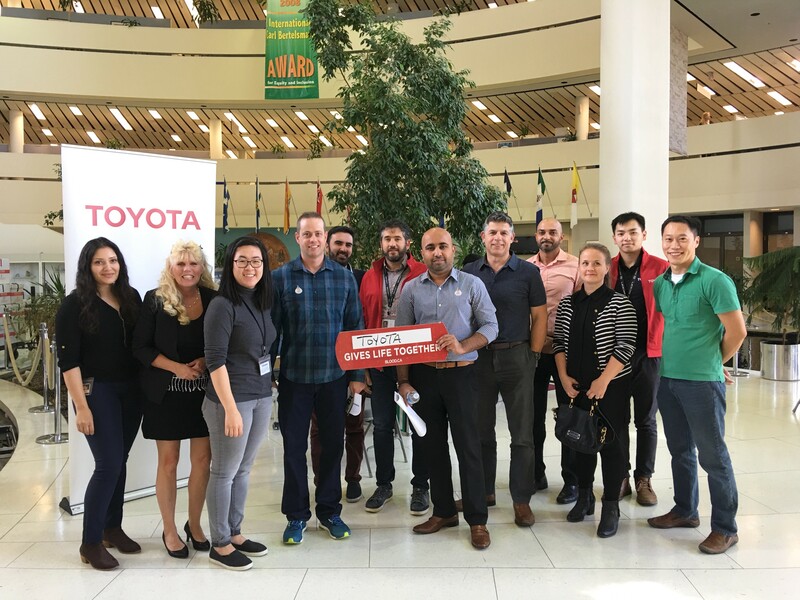 On October 19, Toyota Canada associates from the Toronto head office helped Canadian Blood Services collect 88 units of blood, which translated to 122% of their 72-unit target. Grand Toyota (Grand Falls, NF): Partnered with Canadian blood services in October to provide a shuttle service to those in the community of Grand Falls – Windsor who were interested in donating blood to support the immediate need in the area. Spinelli Toyota (Lachine, QC): Organized a blood donor clinic at the dealership in September, helping Héma-Québec collect blood from 42 donors. Lethbridge Toyota (Lethbridge, AB): In August, Lethbridge Toyota held a “What’s Your Type” event to help customers and dealership staff learn about their blood type, and organized a group blood donation. Laking Toyota (Sudbury, ON): Over Labour Day weekend in Sudbury, Laking Toyota adopted a blood donation clinic to help Canadian Blood Services collect blood donations – always a big need before any long weekend. Over the two days, a total of eight shuttles transported donors to the clinic. Laking Toyota staff enjoyed the experience so much, that they will be adopting a clinic again in January 2018. Toyota Kelowna (Kelowna, BC): Organized a blood drive at a local clinic in May, and challenged another dealership in Kelowna to organize a summer blood drive, which took place in August. Orleans Toyota (Orleans, ON): Held a “What’s Your Type” clinic in late September for customers and dealership staff interested in learning about their blood type. Alix Toyota (Montréal, QC), Toyota Montréal-Nord (Montréal-Nord, QC), and Houle Toyota (Pointe-aux-Trembles, QC): Have collectively partnered with Desjardins Group and Héma-Québec to provide shuttle services for donors participating in an organized blood drive happening this month. Other Toyota Dealerships that have registered for group blood donations and/or “What’s Your Type” events with their staff in the coming months include: McPhillips Toyota (Winnipeg, MB), Frontier Toyota (Winnipeg, MB), Toyota Meadowvale (Mississauga, ON), Toyota Oakville (Oakville, ON), Erin Park Toyota (Mississauga, ON), Stampede Toyota (Calgary, AB), and Toyota Georgetown (Georgetown, ON). Every year in Quebec, more than 80,000 people need blood. On October 30, Toyota Canada associates from the Montreal head office organized a group blood donation to help Héma-Québec meet these demands. Toyota Canada Inc. is encouraging Toyota Dealers across Canada to take advantage of the opportunities available to engage local communities through blood donations and awareness activations.